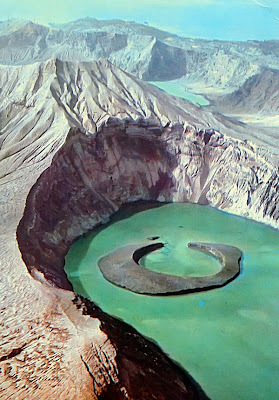 Taal Volcano is a complex volcano located on the island of Luzon in the Philippines. Historical eruptions are concentrated on Volcano Island, an island near the middle of Lake Taal. The lake partially fills Taal Caldera, which was formed by powerful prehistoric eruptions between 140,000 to 5,380 BP. Viewed from Tagaytay Ridge, Taal Volcano and Lake presents one of the most picturesque and attractive views in the Philippines. It is located about 50 km (31 mi) south of the capital of the country, the city of Manila. The volcano had several violent eruptions in the past causing loss of life in the island and the populated areas surrounding the lake, with the death toll estimated at around 5,000 to 6,000. Because of its proximity to populated areas and its eruptive history, the volcano was designated a Decade Volcano, worthy of close study to prevent future natural disasters. It is one of the active volcanoes in the Philippines and part of thePacific ring of fire.